"One of the perks of an academic career is the year-end break in December. It gives us some predictable downtime (or at least a bit of time within our control) when we can reflect on what went well during the past year and how we can “up our game” in the year ahead." summarizes Karen Hughes Miller, associate professor of graduate medical education at the University of Louisville School of Medicine. In the spirit of the season, here are five resolutions to consider for the new year that should bring you and your students greater satisfaction with teaching and learning. 1. Learn your students’ names early in the course, and call them by name whenever you can. When you address someone by their name, you create an immediate bond that is hard for them to ignore. 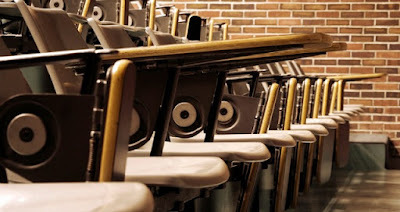 Faculty who know and use students’ names seem more personable and more approachable. Middendorf and Osborn have some suggested strategies for learning names if that’s not something that comes naturally. 2. Create clear rubrics for all assignments, and share them with students when the assignments are given. Nothing puts a greater strain on faculty-learner relationships than disputes over assignments and grades. An unambiguous rubric that describes desired outcomes and assigns points for each category can avoid many misunderstandings. Learners can use the rubric as a checklist to ensure they have addressed each component of the assignment, and faculty can use it as the scoring guide (“Using Rubrics,” n.d.). If you are lucky enough to have a teaching assistant, rubrics also help improve interrater reliability when you have more than one person grading. As you redesign and improve assignments over the years, be sure to update the rubric to align with these changes. 3. Keep your content current—really current! Think about how much new information you see every week from listservs, professional organizational emails, and new journal articles. Then consider how your students would react to your occasionally sharing something on the very cusp of the topic you are discussing. Sharing a PDF of the most recent writing on a topic can help them feel connected to the larger world of academia—not as an additional assignment, but as a point of interest or even a possible citation for their upcoming work. Consider how showing your engagement with your discipline can help generate this same engagement in students. Excitement is contagious.